Researching the Robert Coyle family was easier than most, partly because many of the members of this family seem to have exhibited rather lower fecundity than members of other families under study and partly because of a marked uniformity in career choice by the Coyle men: almost every one of them seems to have been an apple dealer, at least at some point in his life. Robert Coyle, the founder of the Coyle dynasty in Cramahe Township, was born in 1845 in Baltimore, Hamilton Township. His father, John Coyle (1820-ca. 1850) died in about 1850 and his mother, Jane Ryan (1825-?) remarried Robert Mitchell, a Hamilton County farmer: she and the Coyle children were listed with Mitchell in the 1851 and 1861 censuses. Interestingly, at that time the family was listed as being Presbyterians, undoubtedly because Mitchell, an immigrant Scotsman, was a staunch Presbyterian. Previously they had been methodists. Robert Coyle moved to Cramahe Township by 1868 and appeared there in every census for the rest of his life except 1881, when he was a resident of Haldimand Township. The birthplaces cited for his children, if accurate, suggest that he moved around a bit on a local scale: 1867 Haldimand, 1869 Cramahe, 1871 Haldimand, 1872 and 1873 Cramahe, and 1877 Haldimand. Coyle’s fortunes appear to have gradually improved through the years. In 1871 he was listed as a labourer, in 1881 as a farmer, and in 1891 and 1901 as a fruit dealer/apple exporter. From the late 1880’s on he was involved in numerous land transactions, There are too many to list here. It isn’t known when Robert Coyle died. The last reference of him was a land transaction in 1906. By 1914 his wife was listed as a widow in other land transactions. Robert Coyle’s wife was Harriet Williams (ca. 1839-1915), whom he married in 1865 in Haldimand Township. I think they had seven children: Mary (ca. 1867-? ), Benjamin H. (1867-1933), Robert J. (1869-1930), John (1871-1916), James (1872-1954), Joseph (ca. 1873-1875), and David William (1877-?). Harriet died of Bright’s disease (kidney failure) in 1915. In the following paragraphs, the various Coyle family members are discussed. There are no good genealogies for most of them, so the lists of children are gleaned from sources such as censuses. They therefore are likely to be incomplete. This is especially true for the third generation Coyles: Ancestry.ca records get sketchier and sketchier the farther one goes into the 20th Century. The Coyles didn’t move around much. With few exceptions, everyone stayed in Cramahe Township, at least through the cut-off date of 1921. All of them were Methodists (Wesleyan Methodists before the Wesleyans and Epicopals joined forces in the 1880’s). However, Robert J. Coyle appears to have gone over to the Church of England by 1891. Both of his children were also Church of England. Mary Coyle (ca. 1867-?). As far as I can tell, the Coyles had only one daughter. Unfortunately, there is little information about her other than her appearance in the 1871 Cramahe census, when she was about four years old. She was absent from the 1881 census, It is possible that she died as a child. Benjamin H. Coyle (1867-1933) lived all of his adult life in Cramahe. 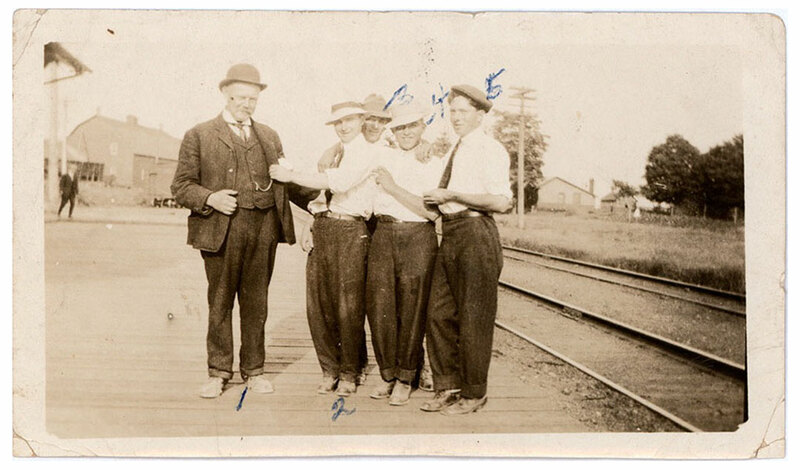 He married Cora Owens (1873-1929) in Colborne in 1894 and apparently had two children: Elmer Owen (1896-?) and “Bernetas” (that’s how it looks in the 1921 census, the only reference; could this be “Berneta”, a variant of Bernadette?) (ca. 1914-?). These children are discussed on page 3 below. Benjamin Coyle ran the Coyle Bros. grocery store with his brother James in 1895, but every other reference for him lists him as an apple dealer. He died of a heart attack in Colborne in 1933. Benjamin Coyle and family lived on Division Street in 1911. This was probably on the east side of Division between North and Creek Streets, where they owned a block of properties consisting of Reid Lots 256 and 270-272. Robert J. Coyle (1869-1930) was a farmer (1889), cabinet maker (1891), fruit dealer (1901, 1911), merchant (1921), and general merchant (1930). He married Catherine LaRue Chapin (1866-1921) before 1889 and had two children: Florence Mabel (1889-1957) and Robert Allen (1898-?). They are discussed on page 4 below. After Catherine (“Cassie”) died, he, at the age of 52, married Lottie Arnold (1895-? ), age 27, in 1922 in Colborne. Robert J. Coyle lived his whole adult life in Colborne and died there of heart disease in 1930. The 1911 census placed his residence on Toronto Street. Land office records suggest that this was probably on the northeast corner of Toronto Street and Norton Lane, where his family owned Reid Lot 50. John Coyle (1871-1916) married Sarah Lowe (1872-1950) in Port Hope in 1891. John and Sarah had five children: Beatrice E. (1892-1975), Richard Clinton (1895-? ), Marjory Kathleen Dorothy (1901-? ), and twins Harriet Doris Naomi (1910-?) and Mary (1910-1910). See page 4 below. Every reference to John Coyle’s occupation listed him as a fruit dealer. He and his family lived in Cramahe where he died of pneumonia in 1916. The 1911 census listed the John Coyle family as living at 172 King Street. This was undoubtedly in the house now numbered 69 King Street, which was owned by Sarah Coyle from 1906 to 1920. James Coyle (1872-1954). Unlike his father, James Coyle’s fortunes seem to have declined through the years, unless simplifying his life was a conscious decision. He was an apple dealer in 1892 and 1893, a grocer (Coyle Bros.) in 1895, and a fruit dealer again in 1901, but then a labourer in 1911 and a gardener in 1921. James Coyle married Mary C. Vandervoort (1875-1953) in Sidney, Hastings County in 1892 and they had two children: James Henry (1893-1958) and Gladys Marian (1899-?). See page 5 below. In 1911 James Coyle and his family lived with his mother in the Keeler House on Church Street. The following picture shows James Coyle behind the wheel of what is purported to be the first car in Colborne. The little girl is Gladys Coyle, his daughter. This puts the picture a bit later than the 1900 suggested in the caption, because Gladys is clearly not 1 year old. The photo is more likely 1903 or so. This is made more likely because, the car looks exactly like photos of a 1903 Cadillac Touring Car. Cadillac didn’t exist in 1900. 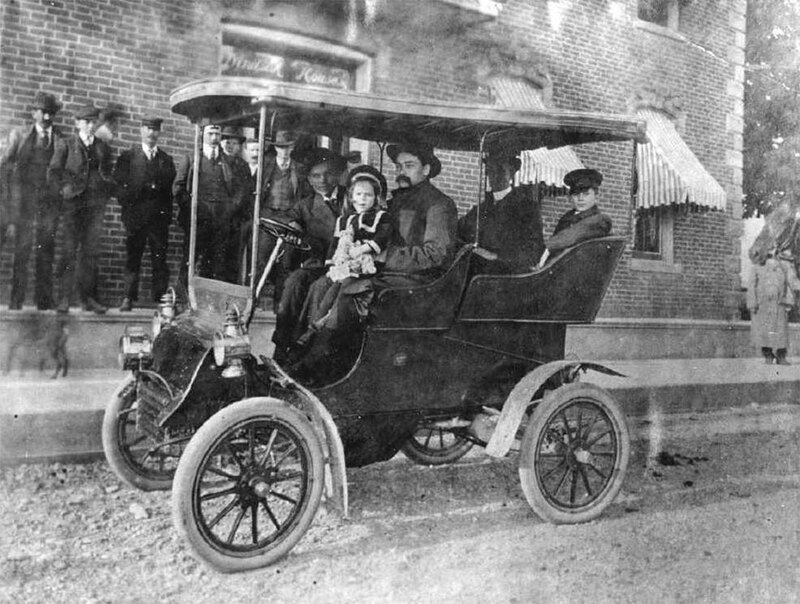 The caption also says that the man holding Gladys is Harry Coyle, and that the two people in the back seat are unknown. But I think the boy in the back is actually Harry Coyle, Gladys’s elder brother, age ca. 10. The man holding Gladys could be one of James’ brothers, who were 46, 41, 32, and 26 in 1903. It’s hard to tell, but by the apparent age of the man in the photo, it is probably one of the latter two (John or David). The man in the back seat has his face in the shadow, but he does look older. So perhaps one of the older brothers, or maybe even their father, Robert Coyle. First car in Colborne (ca. 1900) in front of Windsor House. Driver is James Coyle St. with Harry Coyle holding Gladys Coyle. People in back seat are unknown. Joseph Coyle (1873-1875) died of cerebral meningitis when he was 15 months old. Unfortunately, his death record didn’t record his parents, but it would be hard to imagine that they were any other than Robert and Harriet. I suppose it is possible that some other Coyles were living briefly in Colborne that year, but the possibility seems remote. David William Coyle (1877-?). Again, every reference found to this Coyle’s occupation lists him as a fruit merchant.He married his brother James’ sister-in-law Maude E. Vandervoort (1878-?) in Hastings County in 1894. David and Maude had three children: Pearl Lily (1896-1944), William David (1898-1983) and Marie (ca. 1915-? ), discussed on page 5 below. Elmer Owen Coyle (1896-?) was listed as a fruit dealer in the 1921 census. He had married Marjorie E. M. McDonald (1898-?) in Colborne in 1920. There is no reference to children. In 1911 he lived in the house now numbered 63 King Street. Bernetas Coyle (ca. 1914-?) appears only in the 1921 census. Nothing else is known about her. Mabel Florence Coyle (1889-1957) married grocery merchant Richard Y. Floyd (ca. 1885-?) in 1906 in Colborne. Their son Lyle Allen Floyd (1910-?) was born there. They were still present in Colborne in 1911, but living in Toronto by 1921. Robert Allen Coyle (1898-?) married Clara Amelia Jamieson (ca. 1898-?) in Colborne in 1919. Again, I haven’t seen any reference to children. R. A. Coyle was a merchant, but it is not clear what sort. Beatrice E. Coyle (1892-1975) married Albert Smith (ca. 1891-?) in Toronto in 1912. It is unknown whether or not they had children. They were still living in Toronto in 1921 (without children), at which time Smith was employed as a printer. Richard Clinton Coyle (1895-? ), another fruit merchant, was apparently generally known as Clinton. He married Maude Marie Redfearn (ca. 1896-?) in Colborne in 1917. There was one child, John (ca. 1918-?). Clinton enlisted in the army in 1915 and, according to the Colborne cenotaph, served as a private in England. Apparently he never made it to France. This photo was taken sometime in the late Teens or early Twenties, judging by Clinton’s apparent age and the style of the leftmost gentleman’s suit, and by the fact that Clinton was in England during the War. Clinton’s 1915 enlistment papers refer to him as a mechanic, but in the 1921 census he was a fruit dealer. Marjory Kathleen Dorothy Coyle (1901-?) married Howard Alexander Free (1889-?) in Colborne in 1922. Free was a printer. Again, no record of children. Harriet Doris Naomi Coyle (1910-?) was a twin, born with her sister Mary Coyle (see below). She married Gordon Johnston Hay (1906-?) in Colborne in 1928. Hay was a merchant. There is no reference to their children, if any. Mary Coyle (1910-1910) died of meningitis secondary to mucoenteritis when she was seven months old. James Henry Coyle (1893-1958). Generally called Harry. He married Eleanor May Brown (1893-1979) in Cobourg in 1912. The records show one child, Helen Louise (1913-? ), born in Colborne. At the time of Helen’s birth, Harry was listed as a labourer. Gladys Marian Coyle (1899-?) married Gerald Edwin Fox (ca. 1881-?) in Colborne in Hastings County in 1921. No record of any children. Pearl Lily Coyle (1896-1944) married bank clerk Erle Beavis Laing (1896-1977) in Colborne in 1917. By 1921 they were living in Hastings Village. There was at least one daughter: Dorothea Olga (1918-1991). William David Coyle (1898-1983) married Hilda Marie Purser Nichols (1896-1916) in 1914. There is one genealogy on Ancestry.ca that lists the woman he married in 1914 as Agnes Pauline Harris (1900-2002; died at 102 years old! ), but the actual 1914 marriage record shows the woman involved was Hilda. Since Hilda died at 20 years old in 1916, Agnes was likely a second wife. Note that she would have been only 14 in 1914. The genealogy makes reference to five children of William and Agnes, but they are designated “private”, their names are unknown. The occupation listed on William’s 1916 enlistment papers was mechanic, but in the 1921 census he was a fruit dealer. Marie Coyle (ca. 1915-?). In spite of her presence on the 1921 Colborne Census, nothing more is known about Marie. I have come across three other female residents of Cramahe whose maiden name was Coyle, but who didn’t go by that name while residents of the township. The first was Ann Coyle (1850-1913), who was married to James Fisher Smith (1843-1921) and lived in Castleton for a while in the late 1880’s. Her parents were Irish immigrants John Coyle (1798-1861) and Mary O’Neill (1805-1875), so she wasn’t related to the other Cramahe Coyles. On the other hand, the other two, Eliza Coyle (1847-1922) and Sarah Coyle (1850-? ), were both sisters of Robert Coyle, the founder of the Colborne Coyle clan. They married Cramahe brothers William H. McCracken (1846-?) and George McCracken (1839-1922).